My job is not to tell you what to eat, but figure out what you want to eat and offer it to you. I can tell you from our sales, it's not the ultra-healthy no-taste food. At Hardee's we sell 130 to 150 Thickburgers a day per restaurant and probably two salads. But they're there. I think if we fried the salads, they would sell more. 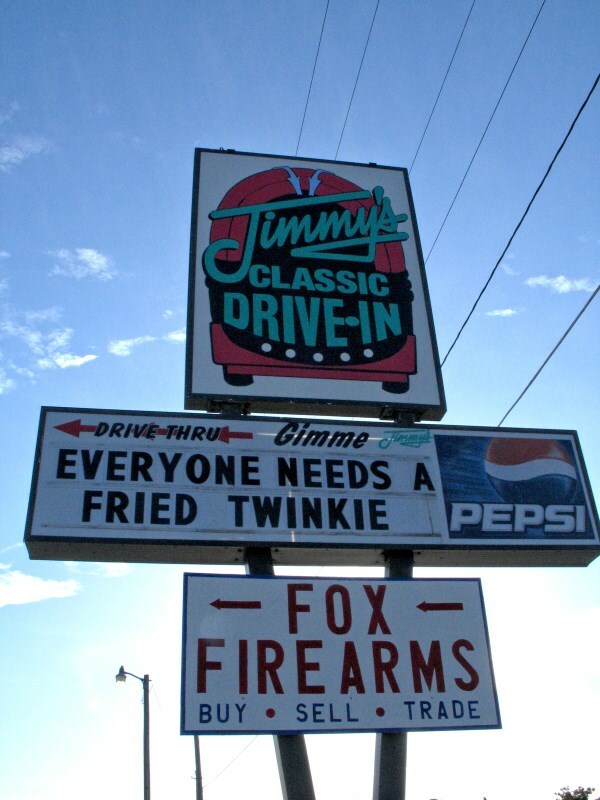 Come to think of it, maybe Hardee's and Carl's Jr. should partner with Hostess to offer fried Twinkies. Puzder also attacks his competitors' 99-cent double cheeseburgers. He points out that one can't purchase the basic ingredients for a good burger at that price, even without paying rent, utilities, and labor (although some may counter that these are "loss leaders" intended to attract customers). Then he puts it bluntly: "People are looking to sell this garbage and trying to out-garbage each other." I wish the interview hadn't been so short. I think I like this guy. PLANO, Texas (March 26, 2008) – Tired of a world in which Americans idolize wannabe singers and musicals about high schoolers pass as rock ‘n roll music, Dr Pepper is encouraging (ok, begging) Axl Rose to finally release his 17-year-in-the-making belabored masterpiece, Chinese Democracy, in 2008. In an unprecedented show of solidarity with Axl, everyone in America, except estranged GNR guitarists Slash and Buckethead, will receive a free can of Dr Pepper if the album ships some time -- anytime! -- in 2008. Dr Pepper supports Axl, and fully understands that sometimes you have to make it through the jungle before you get it right. This marketing campaign is brilliant. No unreleased album has suffered such a long and twisted history as Chinese Democracy. Axl has hired and fired countless sidemen, thrown several tantrums, and remixed the whole mess a dozen times. I remember following this saga online ten years ago when the disc was already "long awaited." Since then, Guns N' Roses has done multiple tours supporting this legendary non-release. I'm surely not the first writer to quip that Axl is waiting until there actually is democracy in China. Would I buy Chinese Democracy? My interest in GnR has been waning for so long that I probably wouldn't bother anymore. Besides, disappointment is almost guaranteed after 17 years of hype and anticipation. Even Appetite for Destruction, a genuine classic, may have collapsed under the weight of so many mixing sessions and band roster changes. If I had a can of Dr Pepper for every supposed Chinese Democracy release date I've heard, I'd... well, I guess I'd really have to pee. Will Dr Pepper's challenge finally get Axl to stop remixing and start pressing CDs? You can follow all the exciting inaction on the Chinese Democracy When? blog. Somebody at WTTW screwed up. It's bad enough that this mentions "the 8-CD set" -- that shows that the program description likely was cribbed from a "thank-you gift" description. But to bluntly state that this program was "designed" to get people over age 50 to make pledges? That's crass. "Hello, Mom? I just called to tell you about a show tonight on Channel 11. It's got a bunch of sixties music, and they really want your money." I got a phone call Sunday afternoon from a marketing company representing the Chicago Tribune. The caller informed me that I will now receive the Wednesday and Friday newspapers free in addition to my usual Sunday edition. There's one problem--I don't want two more days of newspapers cluttering up our house. Heck, sometimes it takes me until Wednesday to finish working through the Sunday paper. I get most of my news online, and all that paper is just a waste. We used to get those days, but we canceled because we never opened them. Those newspapers went straight from their clear plastic bags into a blue recycling bag. I politely told the marketer that I did not want the Wednesday and Friday newspapers. He replied, "You're already getting them. We signed you up for this free gift as a thank-you..." But I don't want them, I replied angrily. "You'll have to call 1-800-TRIBUNE to cancel it." Why can't you cancel it? "You'll have to call 1-800-TRIBUNE." What kind of customer service is that? Why should I have to take the initiative to stop getting something I didn't ask for and don't want? This isn't the first time the Tribune Company has used the unwanted free newspaper tactic. They gave us RedEye, a silly paper not even thick enough to use for bird cage liner (not that we have a bird anyway), for several weeks. That was a little different, though. It was a brand new paper, we only got it for a short time, and no intrusive telemarketer called to tell us all about our "free gift." If it wasn't for the ads and coupons in the Sunday paper, I would cancel my entire subscription just to spite them. I suppose I should give the Tribune Co. a little credit, though. At least they are trying to increase ad revenue by giving away free papers, as opposed to the rival Sun-Times, which scandalously overstated its circulation instead. Update 11/17/04: I e-mailed Tribune customer service, and they said that my account has no record of those days that the telemarketer said I was already signed up for. Update 12/05/04: As I expected, I started getting the unwanted newspapers the week after I contacted customer service. I e-mailed them again, and they stopped delivering those days. I also had them remove me from their marketing lists. 1.) There is a brand of cheese called "The Laughing Cow." Am I the only one who associates laughing with insanity, as in Pink Floyd's "Brain Damage/Eclipse" from Dark Side Of The Moon? A synonym for insanity is madness which, of course, leads us to mad cow disease. Hmm, maybe I don't want my cheese from a laughing cow, however cute the happy cow character may be. 2.) The Balance Bar company has a new line of bars called "Balance Carb Well." Lots of food manufacturers are bringing out low carb products these days, but isn't there something wrong with this? The company's products are based on the nutritional theory that the proper caloric balance of nutrients is 40% carbs, 30% protein, and 30% fat. A low carb product undermines the company's entire premise. While they may regain some former Balance Bar consumers who have gone low carb, they may confuse a lot of potential customers, too. I got a phone call yesterday. The man told me that I won a Chicago Sun-Times raffle. I never entered such a raffle, but I figured I'd hear the guy out. Well, the prize I won was "the Sunday Sun-Times for only one dollar a week." Since when does a raffle prize require you to pay for something? Gee, what a deal. Then again, I wouldn't want the Sun-Times if it was free, either. The Sunday Tribune is more than enough to read, and the Sun-Times is a third-rate paper at best. The other day I shopped at a Dominick's grocery store. I noticed that unlike most stores, they had the condoms near the end of an aisle at the front of the store. Then I saw that the liquor department was only 15-20 feet away! I guess they're going for those Friday night one-stop shoppers. Today I turned in my Cosi lunch card for a free salad. Yippee! I just walked up to the counter, handed the man my stamped card, and walked away with my lunch (no tax, either). Getting the eleventh salad free almost justifies paying seven dollars for the first ten. There is some interesting psychology at work there. I surely enjoy turning in my card for a completely free meal more than I would appreciate saving seventy cents on each salad I buy, even though the cost would be the same. I guess it's because just once I can thumb my nose at the old saying, "There ain't no free lunch" (or as a grammar maven, I can turn that double-negative into a positive). For anyone who cares, I get the "make-your-own" salad with mixed greens, tandoori chicken, bacon, hard-boiled egg, parmesan cheese, and caesar dressing. They toss it for you, too.